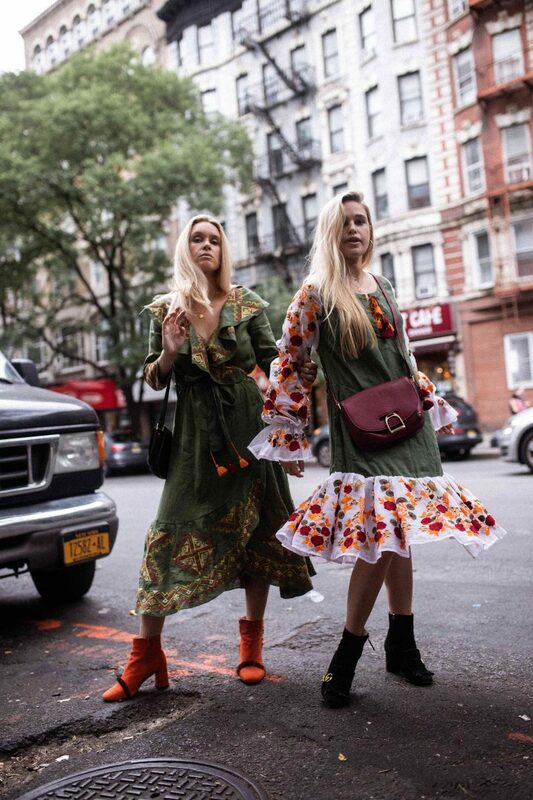 We have just returned from our first New York Fashion Week and it did not disappoint, the city that never sleeps definitely knows how to do fashion week and there are so many shows and events going on all over the city that you could go crazy, so its best to pace yourself and base shows around brunches, no really. Our first look was this pink and gold concoction, if you follow us you’ll be aware that we love bright bold colours and co-ordinating looks, and this was one of our favourite looks to rep on the streets of Manhattan where colours pop on every block. Our next look and we were off to the All Things Mochi presentation in these bold blue midi dresses by Ghost. Ghost is a really beautiful brand that we have long admired, so it was really exciting to be wearing their dresses to shows and we had lots of compliments on the colour. Look 3 were these gorgeous dresses from the brand Svitlaya. We spotted this brand on few of our friends and commented every time on the fantastic quality of them. We love that they are chic but also have an element of fun to them. We also have had so much wear out of these bags from Village England, again the quality of these is beautiful. Luckily for Alice on the day that it rained she had her bucket hat to save on the way to the Nonie show. This outfit was nearly all by a brand we LOVE called House of Sunny! We love how their pieces are so unique yet wearable. Can’t get over how insane Olivia’s Skirt is and so many people commented on it! On the hunt for a dress that was animal print but in the hope that not everyone had the exact same one we found this dress in a local boutique. The brand is Lily and Lionel and has a range of lovely dresses in particular if you want something different for a wedding! We loved mixing these Autumn tones and again have had so much wear out of this suit! Also what you can not see in these picture is this silk blouse that Olivia is wearing is backless and beautiful! We hope you liked having a look at what we wore to NYFW and let us know if you have any questions. Also if you wanted to take a look at our week in more detail please to head over to our YouTube channel and take a look!